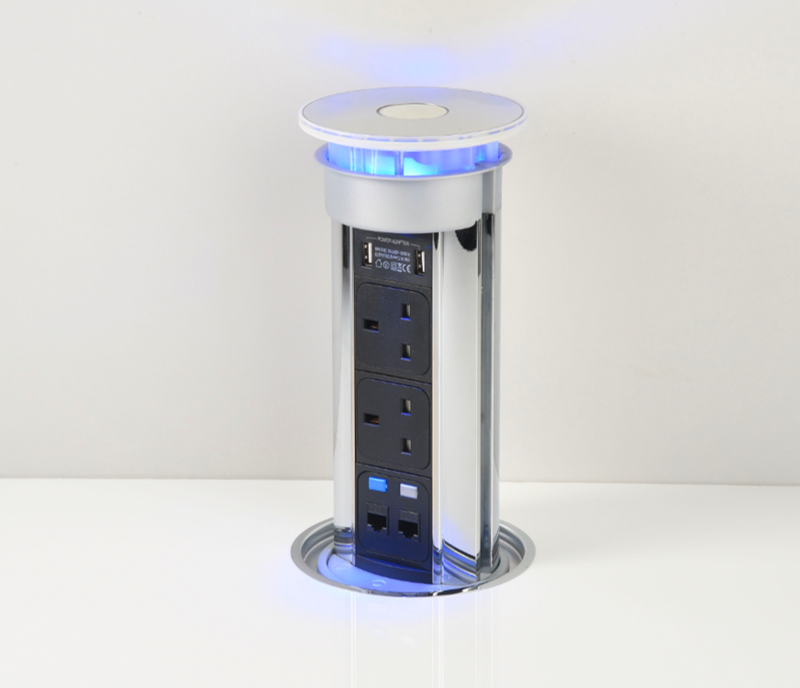 100mm Diameter Pop Up Power Unit with 2x UK Power Sockets & 2 Cat 6 Data Ports. This particular model comes with extra features, such as USB Ports and LED. Just peel back the protective film�and drop it in a predrilled hole ready to go. Supplied with standard 2 metre leads and fitted plug for any UK Standard 3 pin system - just like a deluxe extension socket! The Bright Chrome Top Disc compliments the Two-Tone Black & Chrome surround and you just depress the white button to�'pop-up' the unit about 25-30mm�- and then draw it into position. Adds that real wow factor to any kitchen, especially when used in conjunction with the flush fit adaptor ring - will require a 124mm hole. From time to time, we rotate the stock in our showroom and photograph new products, so we occasionally list Ex-Demo units. We also often have stock of factory refurbed units, so if you decide to go for one of these, you'll benefit from a significantly reduced price but obviously you need to appreciate there may be blemishes where the units have been handled and the unit may not have the protective film on etc. We grade the units A, B or C which is reflected in the price reductions but none are what you'd call damaged and are certainly perfectly saleable. However, for those with a critical eye and if you;re wanting a unit in perfect condition straight from the factory, then we'd recommend you buy new - or at least come and see them for yourselves in our Banbury showroom. This unit is predominantly manufactured from a quality Zamak (Metal) material�and will enhance any kitchen, workspace or prestigious development, where power or data distribution is required. � As with all our concealed sockets, we always recommend you get a tradesperson to install this unit. Unit comes with flush fit adaptor ring in the box. Prices exclude VAT. Display prices including VAT.